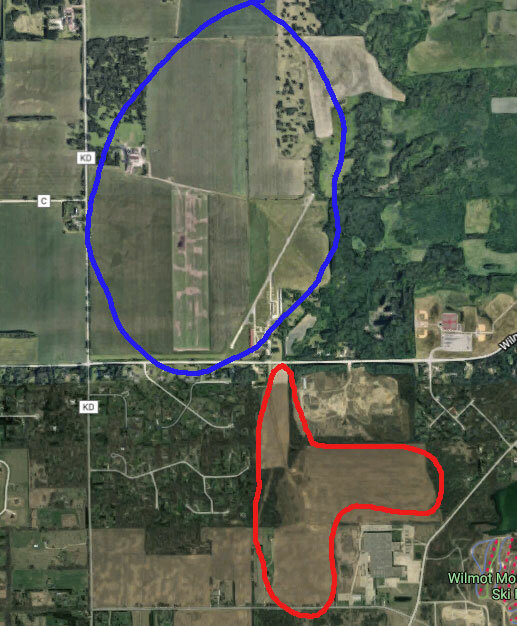 The area marked in blue by this map is approximately where Thelen had earlier thought it would begin mining. The company now wants to begin mining in the area marked by red. Locations shown in this map are approximate. /underlying map from Google Maps. Thelen Sand and Gravel won approval from the Twin Lakes Plan Commission Wednesday to change where it will begin mining operations on property it owns in Twin Lakes. Thelen in 2006 filed a plan to begin extracting of minerals from property it owns north of Highway C in the area of Highway KD and Highway C.
Instead, it would now like to mine from property it owns south of Highway C and north of Highway CK west of Fox River Road. Robert Procter, an attorney representing Thelen at the Plan Commission meeting, said the change is driven by the company currently extracting materials on property in Illinois closer to the more southerly property in Wisconsin. That made starting farther south among the Wisconsin properties more feasible. Plan Commission members agreed that the change was not a substantial deviation. A resolution to that effect was approved by a unanimous voice vote of the commission Wednesday. “To me, there’s no problem,” said commission member Richard Diedrich. Thelen now will also need approvals from Kenosha County before it can start mining, Procter said. About 20 people attended the meeting, most of them from Randall. Randall town Chairman Bob Stoll said after the meeting that Randall residents in nearby neighborhoods would likely favor the mining operations beginning farther south, as Thelen is now proposing. The Thelen owned properties were annexed into the village after opposition to mining surfaced among Randall residents. Boy things have changed in 14 years. Twin Lakes Area Chamber & Bus. Assoc.